As per the old system, all parking zones were divided into A, B, E and F. E zone refers to parking at the Deira Fish Market and F zone refers to parking in the Tecom area. Under the new parking system, all zones fall into three categories - commercial, non-commercial and special areas. This includes all roadside parking in commercial areas and are to remain the same. 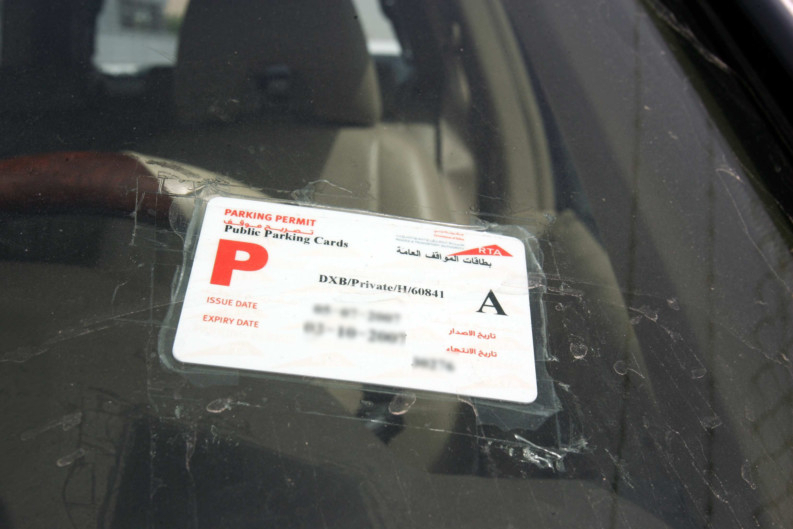 Drivers with seasonal parking cards for zone A can continue to use them, until expiry, for zones A, B, C and D.
Tariff Dh4 per hour, Dh8 for two hours, Dh12 for three hours and Dh16 for four hours; you can also park for half an hour for Dh2. This zone includes all parking lots in commercial zones and drivers holding seasonal cards for this zone can park in zones B and D.
This new parking code covers roadside parking in non-commercial areas and signboards have already been set up for this zone. This parking zone covers all parking lots in non-commercial areas. Signboards have been put up now in these areas. See our full story here. This used to be the dedicated parking code for the Deira Fish Market. This is the dedicated parking code for parking in Tecom areas. This includes the paid parking areas in Downtown Dubai and is not affected by tariff changes. Seasonal parking cards that are still valid can be used as mentioned above. Roadside parking The new seasonal card rates for roadside parking are Dh1,400 for three months, Dh2,500 for six months and Dh4,500 for one year. Parking lots The new rates for seasonal parking cards for parking lots are Dh700 for three months, Dh1,300 for six months and Dh2,500 for one year. Which areas fall in each category? In the new parking tariff system, paid parking zones are categorised into two and payments are according to these specific categories. In Deira, it includes Abu Hail, Hor Al Anz, Al Baraha, Al Muteena, Al Khabaisi, Al Muraqqabat, Riqqa Al Buteen, Port Saeed, Al Riqqa, Naif, Ayal Nasir, Deira Fish Market, Al Ras and Al Buteen. On the Bur Dubai side, areas like Al Shindagha, Al Souq Al Kabeer, Al Hamriya, Umm Hurair 1,2, Oud Metha, Al Karama, Al Mankhool, Al Raffa, Al Hudaiba, Al Kifaf, 2nd December street, and the sector between Dubai World Trade Centre and Interchange One on Shaikh Zayed Road fall under category one. Also falling in category one are Jumeirah Beach Residence and the JBR Walk, as well as 308th street and Al Saada street, parallel to Shaikh Zayed Road between Dubai World Trade Centre and Interchange One. This category includes the rest of Dubai and rates are expected to remain the same as before. Tariff has increased to Dh5 per hour from Dh3 per hour for RTA multi-storey parking lots. 1. Coins You can buy your ticket using coins at the nearest paid parking machine. 2. Prepaid card The pre-paid parking cards are available at supermarkets and grocery stores in denominations of Dh30 and Dh100. The ticket amount is deducted from the balance on the card when inserted into its respective slot on the machine. 3. Seasonal parking cards Seasonal parking cards are available in different values and periods of validity. Cards fall into A , B and T categories and are available in three-month, six-month and annual validity. 4. mParking Send an SMS to 7275 in the following format: number plate-space-area code-number of hours. You can opt for hourly alerts for renewing your parking tickets at an extra charge of 30 fils per SMS. 5. Nol Card Use you Nol card to buy your parking ticket and the amount will be deducted from the card balance. 6. Smart Parking A free app for parking, Smart Parking charges no additional cost for transactions done on the app. Can't remember your zone number? Use mparking through the RTA mobile app and you don't need to.